Man Utd and Arsenal are reportedly among a number of clubs looking to swoop for Portugal midfielder William Carvalho this summer. 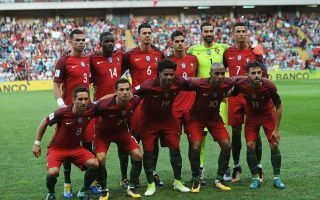 The 26-year-old has established himself as a staple of the Portuguese national team, playing a key role in their success at Euro 2016 while he’ll hope that they can repeat the trick in Russia at the World Cup this summer. However, while things are going well on the international scene, his club future is anything but drama free after the Sporting Lisbon players were attacked at their training ground last month, as per The Guardian. That led to a whole host of first-team players cancelling their contracts, with Rui Patricio amongst those leaving and having now been unveiled as a Wolverhampton Wanderers player, and reports claim a transfer battle is developing over one of his former teammates. As reported by The Sun, via the paper edition of Record, Man Utd and Arsenal lead a number of clubs in the race to sign Carvalho, with West Ham United, Wolverhampton Wanderers, Monaco, Atletico Madrid, AC Milan, Marseille and Porto among the other clubs specifically mentioned as holding an interest. That tells its own story in how highly-rated Carvalho is, as he can sit in the deep-lying midfield role and offer defensive coverage as well as set the tempo with his distribution forward. Given Unai Emery already has Mohamed Elneny and Granit Xhaka to play a similar role at Arsenal, it remains to be seen if that’s such a sensible move for them. Meanwhile, United boss Jose Mourinho has new signing Fred along with Nemanja Matic and Paul Pogba at his disposal, and so it remains to be seen if Carvalho would be keen to face such quality competition for a starting berth. Nevertheless, it’s fair to say that he would improve any squad he joins, but given his ongoing involvement in the World Cup this summer, it’s surely unlikely that there will be any major updates on his future before the conclusion of the tournament.